How to Hide Files and Folders on Every Operating System? I loved those days when knowing answers to questions like How to Hide Files and Folders on Every Operating System made me feel like a pro hacker, although that's not the case anymore. 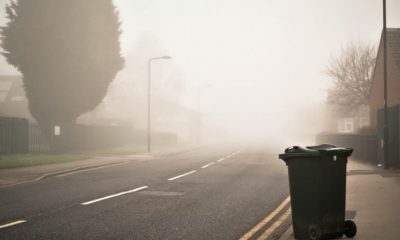 Just about anyone with a working computer system can find his way around answers to questions like How to Make an Invisible File, and How to Make an Invisible Folder. And trust me some of the methods in this article were actually “discovered” by me back when I was around 12. Ofcourse others might have known about them already, but I didn't and I came across those methods just because I was desperate enough. But before getting into the details of How to Make an Invisible File on Your Desktop, let me get into some of the basics. So okay you might be wondering how good will these file hiding methods be. Let me tell you, Windows has an official “hiding” option, which isn't really hidden anymore so although I'd be discussing it, I'd say it's 2/10 on a rating scale. Although the other methods I'd be discussing are almost like password protecting the files and folders, just without using any software or code or anything, so let's scale them 5/10. But well considering you don't work for the FBI or the NSA, you don't need 10/10 methods either, so yeah these methods will do for you. Select the file you want to hide, and right click on it, then select Properties. Now click on the “hidden” checkbox, and click on OK. Done! The file is now hidden. 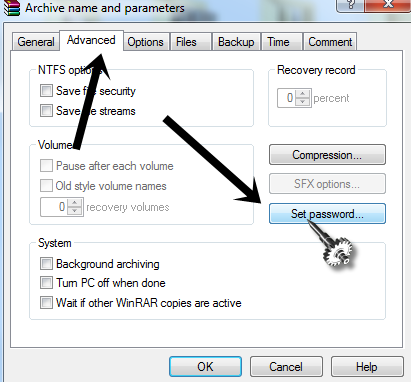 Now this is the first method I was talking about, and it's not exactly a secret anymore as it exists from the days of Windows XP so every guy knows about it, so it's the least secure way to hide files and folders, but it's still a way. 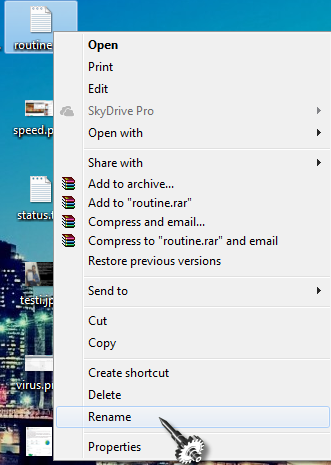 This method comes in handy if you're trying to hide a “file” and not a folder. I mean something that has an extension, like album.jpg document.dox notepad.txt etc. 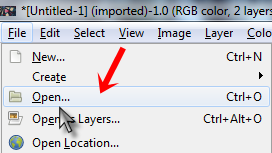 So okay select the file you want to hide> Right click > Rename. 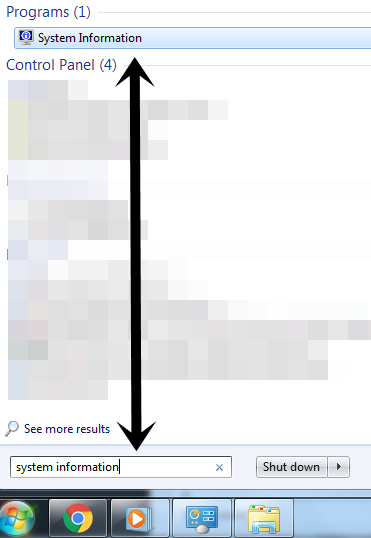 And when a box like the following comes up, just click on OK. So what you did is, you made a notepad file look like a photo. First of all, a photo is not something as interesting as a “password” file. And secondly, it's originally a notepad file, while I used a photo extension (.jpg), so it partially corrupts the file and it won't open. Additional Security:- Now if you want to make it totally “hidden”, I'd suggest placing it with other filetypes of the same type. Meaning I'd place this photo (really the password file) with some of my other photos. So anyone looking in the folder will think it's just another photo file which was corrupted for some reason among other photos. Just rename it back to the original extension. The “name” doesn't matter. Meaning if originally your file was “passwords.txt”, even renaming it back to “i want my file back.txt” will work, just keep the extension same. This one consists of “password protection” but I'd still scale it below the above method when it comes to security, because passwords? If you ask me, I'd say they're the least secure part of your digital life. So anyway, this comes in handy in almost all the situations, if you're trying to hide a single file, or if you're trying to hide more than one files, or if you're trying to hide folders well it covers everything. 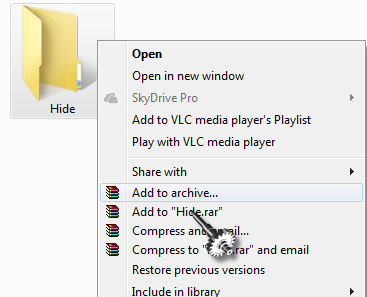 Just select the File / Files / Folders you want to hide, and right click > Add to Archive. Now go to the “advanced” tab and click on “Set Password”. Where a new pop-up box would come up, and you just enter your desired password in the box and click ok. Done! This will compress all your files and folders into one single file (if you've more than one files you're trying to hide!) 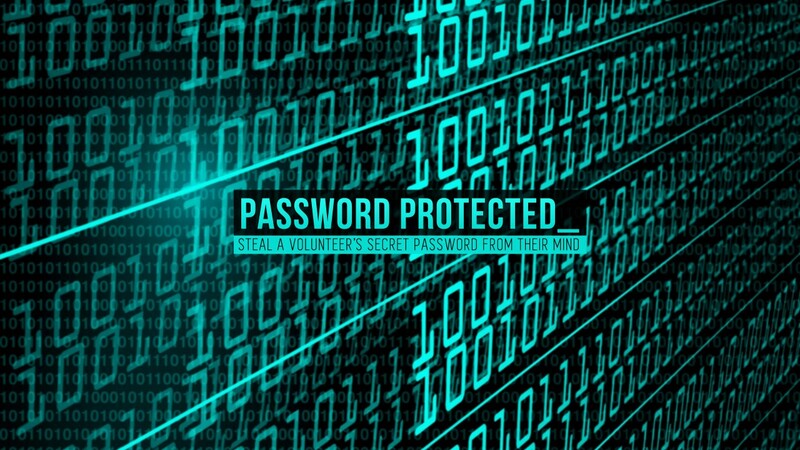 and password protect them. So next time anyone tried to decompress the archive, they'll be asked for the password. 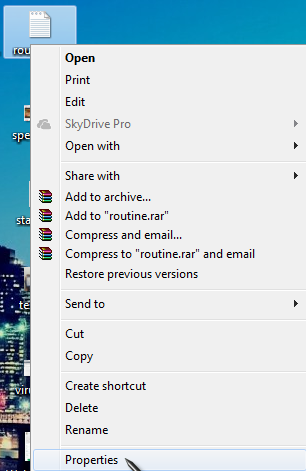 So that was all I had on How to Hide Files and Folders on Every Operating System guys. 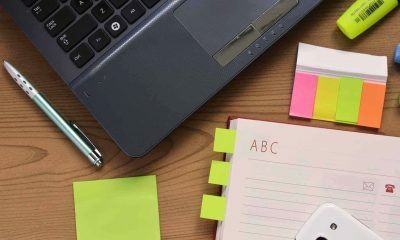 Although let me tell you there's one more method How to create blank folder names in Windows but for some reason it stopped working with the new windows releases so I omitted it from this article. But anyway I'm pretty sure the methods I've discussed will help you out with hiding your files and folders good enough. If this piece helped you, do spread the word by sharing this on your social media timelines, that's the only return we ask from you guys. How to Check Laptop or PC Specs? 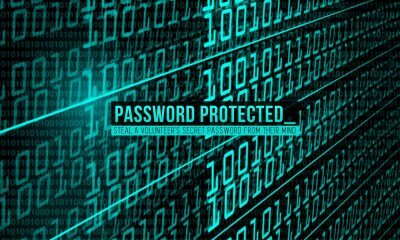 How To Password Protect Any Windows Program? 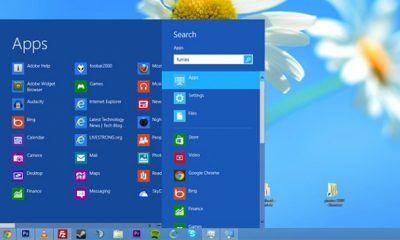 How to Create Personalized Start Button for Windows 8? How to Speed up the Start up Process for Windows 7? 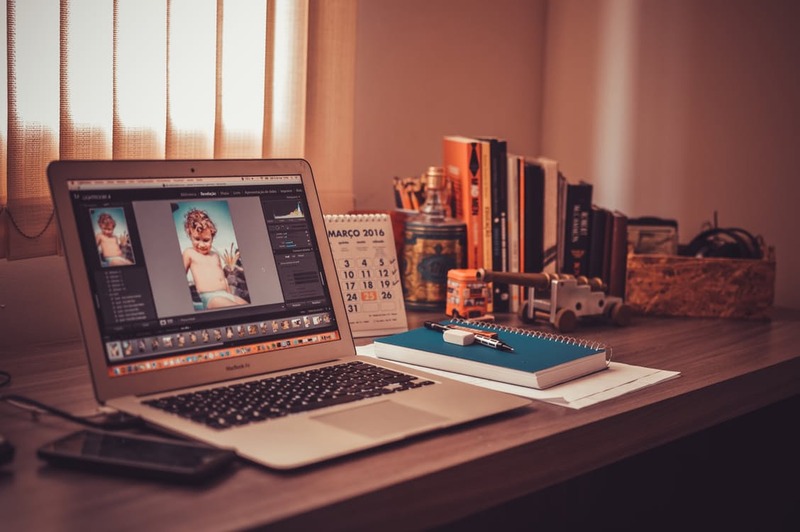 How to Delete a Photo on the Desktop? How to Resize an Image Without Losing Quality? Have you ever clicked a picture with a high-definition camera, tried to enlarge it, and suddenly it starts to look as if it's a picture clicked with a cell phone from the 2000's? Or maybe you uploaded your picture to your blog or WordPress, and again as you try to enlarge it, it becomes all grainy and messed up? That's the one problem we would be solving throughout this piece. Because loss of quality in pictures when they're enlarged is an age-old, universal problem. Before explaining to you how to resize an Image let me shed some light on “why” the loss in quality happens in the first place. Also, take a look at converting PNG to JPG without loosing quality. Why do Pictures Lose Quality when Enlarged? There are a number of explanations for this with a lot of complicated terms and definitions, but let me make it simple for you. Consider your screen to be a balloon. Now throw some paint on it, and then stretch the balloon. As you know the amount of color you threw on the balloon is limited, and every pigment of color landed at any specified point on the balloon. Now when you stretch it, the same amount of color has to cover more area due to the stretching, so obviously the color density becomes lower, won't it? That's the exact same thing with pictures on a screen. 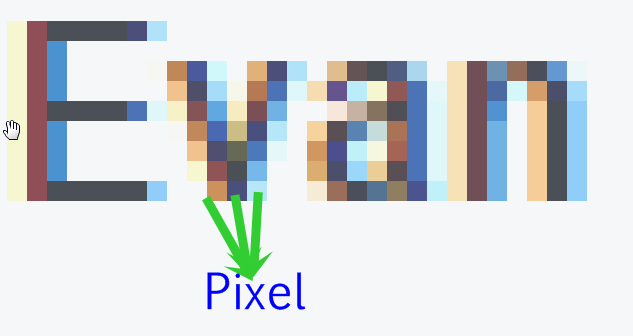 They're comprised of “pixels”, each pixel has a specified area to cover on the screen, so when you enlarge an image, they get stretched to more area than they were actually meant to cover, and hence the color density gets lower and the image blurs. So what's the solution? The one thing I love about the digital industry is, there never is a problem without a solution. And I mean this for every problem out there, so obviously one exists for our picture resize problem as well. Solution 1:- Fractal Interpolation is what will help us achieve what we're trying to achieve. It's the technique of compensating for every pixel you enlarge, and matching the properties of that pixel to the nearest pixel. Solution 2:- Resampling is a method where your size is changed but not by interpolation, instead the number of pixels in the image are increased or decreased as required to keep the quality loss at a minimum. If you aren't familiar with Graphic designing or Adobe Photoshop, then don't stress over the terms, let me just give you a solution to the problem directly. GIMP is a free tool that resembles the basic properties of Adobe Photoshop. And it does have an in-built tech to help you resize an image without loosing quality. Click on “Image” > Scale Image. Specify the dimensions you want. 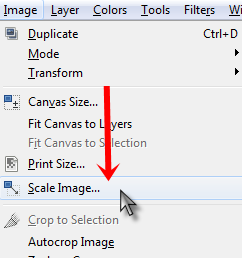 And in the “quality Interpolation” section, choose “Sinc LancZos3″ and click on scale. Done! The quality interpolation you chose did the rest of the job, so your picture should now be resized without a significant loss in quality. Paint is another easier and faster way to resize an image and it's my personal faviorate for the reason that it's much faster compared to Adobe Photoshop or Gimp if I'm resizing a lot of images. 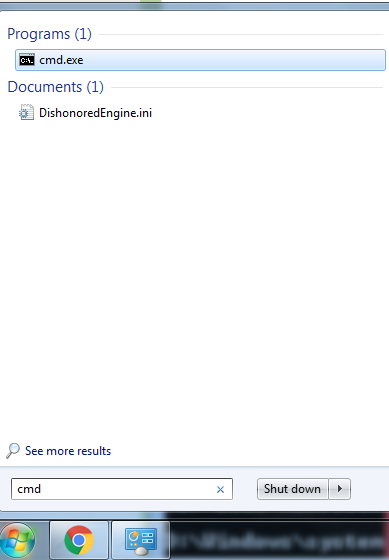 Also, it's available by default on Microsoft Windows. 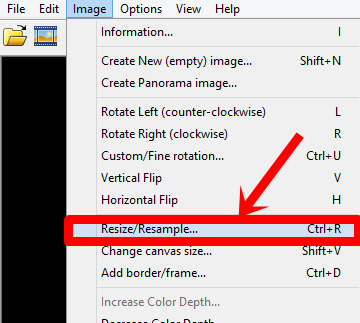 Note:- Paint doesn't resize your images without loosing quality, so there will be quality loss, I'm scribbling this section here keeping just the “how to resize an image” part in mind, and not the “quality loss”. 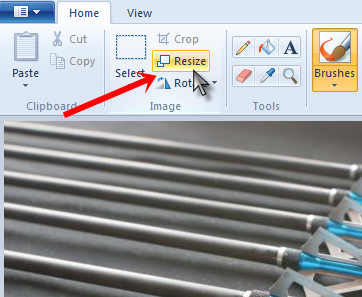 Open the picture you're trying to resize with paint and click on Resize button at the menu-bar. 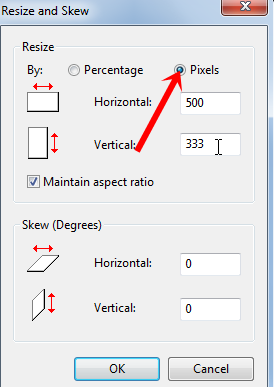 Now click on “pixels” if you know the exact dimensions you want for your picture, specify the dimensions and click OK.
Or, if you're not sure of the dimensions but instead are more comfortable using a ratio/percentage compared to the current image, click on the percentage radio-button and specify your needs. Done! 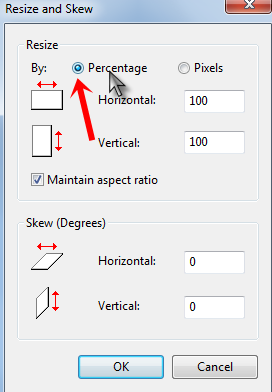 So if you've ever wondered how to resize an image in Paint, that's how easy it is. It's basically a three-click step. Resize > Percentage/Pixels> Specify needs > OK. Yet another simple, light-weight program which calls itself Irfanview comes to your rescue when you're trying to resize an image without loosing quality, and it uses a slightly different process compared to Gimp, as it doesn't only Interpolation, but Re-sampling as well. 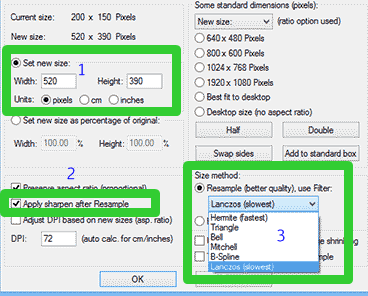 And then just specify your size > select “Sharpen after Resample > and in the Size method choose “Lanczos”. Talking about images and quality loss, I can't afford to miss out vector images out of the discussion. I'll keep it short. Vector images are images which aren't made up of “pixels”, instead they're made out of polygons with specific connection points. Meaning you can zoom in on a vector image all you want, but there won't be any pixelation or “blur” effect, instead, the image looks just as sharp as with the general view. So in short, Vector images don't lose quality when enlarged or resized! You can also use Photoshop to compress the photos without loosing quality. Here is how to Photoshop pictures. Let me tell you, all the above methods (except paint) help you resize an image without loosing quality, but all of those methods don't eliminate the quality loss totally. Along with photos, you can also compress large video files without losing quality. Doesn't matter if you're using Gimp, IrfanView, or Adobe Photoshop itself, there almost always will be a quality loss (unless you've got NSA grade tech), what can be changed and controlled is the amount of quality loss that happens. The methods I've discussed guarantee the minimum quality loss that's possible, at this price-range(they were FREE!). Although if you're looking for a better solution, there are quite a number of premium/paid plugins and tools out there. So that was all I had on how to resize an image without losing quality folks. Hope it solved your queries. Anyway do let me know your experience on this piece and also if you've got any other solutions to counter the image resize problem without loosing quality, and I'll love to include it here if they're really as good as you claim them to be. We all spend thousands of dollars on getting the “right” computer for us, don't we? Some of us need it for Gaming, some of us need it specifically for office use, while others for working with Graphics and video editing and so on. So that's what this article is about, we will deal with How to check laptop or PC specs? With all the modern models coming everyday on top of each other, it's pretty hard deciding which one to go with because ofcourse all of them claim to be the best. But once you know your specific PC specs, you'd know what you have (or don't have), and you can upgrade accordingly right? Ofcourse I'll be answering how to check laptop or PC specs, but I've always felt it's better to understand the “why” before the how. Meaning, let's first deal with “why” you'd want to learn how to find computer specs in the first place. 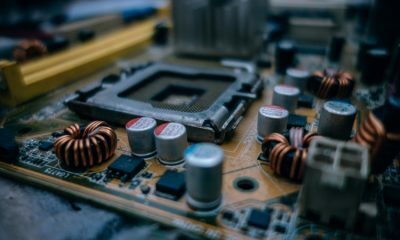 Why to Check Laptop or PC Specs? To analyze your current system, so that you know what other upgrades you need for better performance. 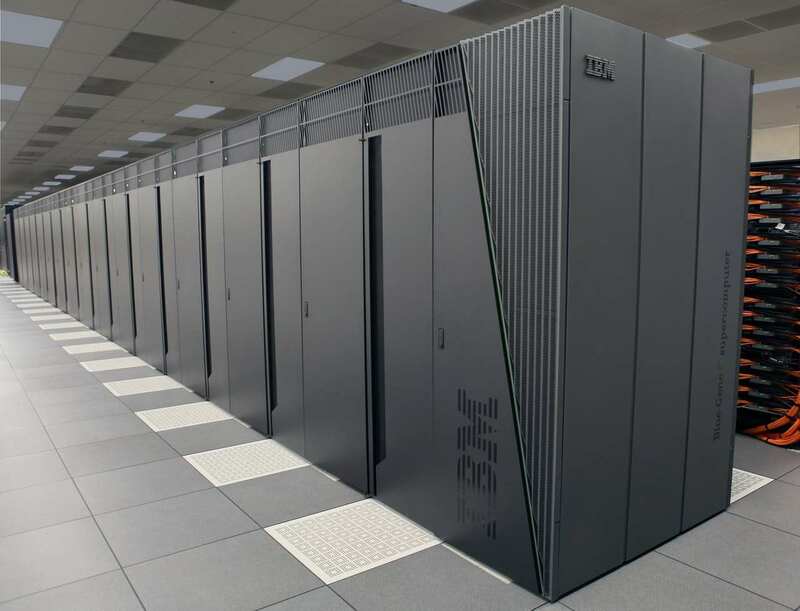 Your system might be slow, and you're looking for the exact hardware to replace. 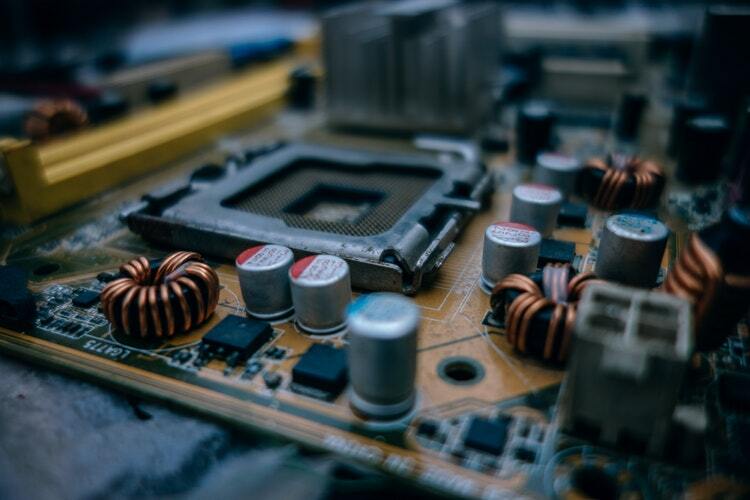 Meaning, just because your system is slow doesn't mean it's always a RAM error, maybe your mother-board is too used up and you might be thinking how to check what motherboard I have? Or maybe your Hard-disk isn't sufficient and so on. Running Games:- Well this one is my personal faviorate. 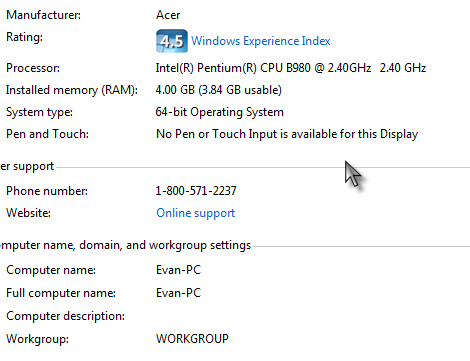 Before I buy any game, I go online and check it's minimum requirements, and once I get a hold of the requirements, I'd need to know what are my computer specs and to know that, I'd need to learn How to view laptop or PC specs to assess if my system will be able to run the game or not, right? So finally we're down to the section you've been waiting for, let's have a look at How to view laptop or PC specs. Well, on most laptops, you might have stickers on the side of the battery which tells you your PC specs. (Unless you've already peeled it off). So let's go with a more “stable” solution for how to check your computer specs. 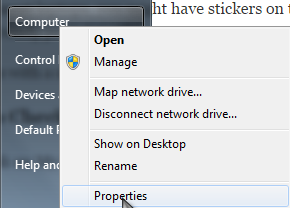 Right click on My Computer, and click on Properties. 1. Rating:- The Rating is the overall rating of your system out of 5. Mine if 4.5 so I'd say it's one of the best specs you can get for a general laptop at my price-range (mine cost just 19,000INR / Around $300) As long as it's above 4, you can be happy. 2. Processor:- If you're checking out your specs for gaming purposes, this is the most important metric for you. Games have very strict processor requirements. 2.40 ghz is the CPU speed. The ghz controls the copy-pasting speed, file opening speed and stuff like that. My system is 8 years old, but today you'd get 3-3.5ghz CPUs easily. 3. Installed Memory:- This answers your question “How to identify RAM”. Because the memory shows you exactly how much of RAM your system got. On today's market, 6-8GB is a general preference. 4. System type:- Well you probably already know that Windows has 32 as well as 64 bit versions right? They both have their own pro's and con's, for eg. on the 32 bit you can only have a max RAM of 4Gbs. But anyway this gives you your Windows bit. This is method is comparatively simpler than the above one. Just click on your Start button, and type “system information”. Select the system information option at the top, and you'll get a list which has almost every single bit of information that exists on your system. 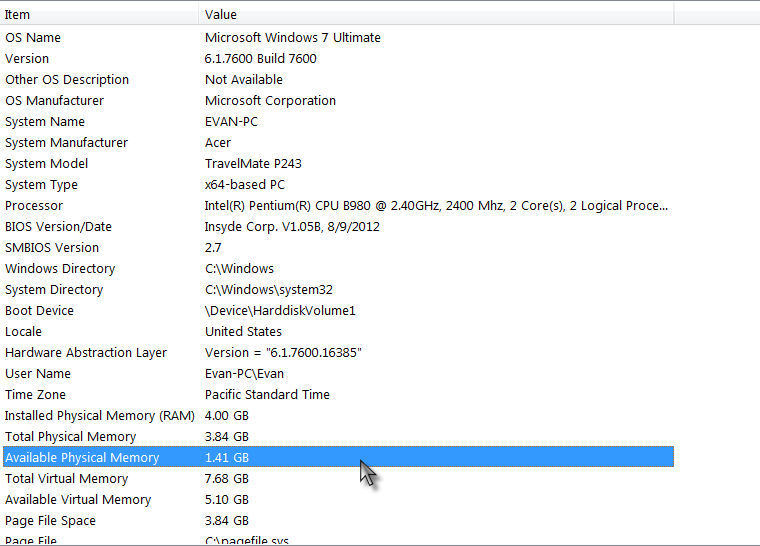 It shows you your RAM, PC Model, Manufacturer, Windows-bit and everything else! Infact, if you look closely you'll notice that it gives you more information about your processor than the above system properties screen. How to Check which Graphic Card You Have? I'm making this section separately because the system properties doesn't list your “Graphic card specs” on the page. Again go to My Computer > properties. And then click on “device manager”. You should see “display adapters” just click on it and it would show you the graphic card your system owns. Well the Motherboard is one of the foundations of your whole system. You might want to know this because just because you bought a 8 GB DDR3 ram doesn't necessarily mean your motherboard will support it, same goes for Graphic Cards or pretty much any other hardware. So well ofcourse you need to know which Motherboard you own and then upgrade it accordingly, right? 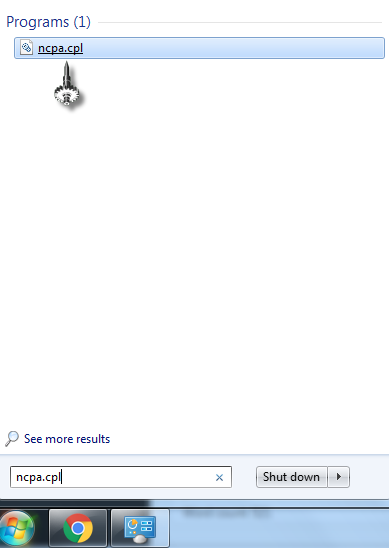 In order to check your Motherboard details, go to start menu, in the search box type “cmd”. As you can see it's a basic string to get the Product Manufacturer, version and serial number. Once you hit enter, you'd get all the details. You'd get the version, model and every other detail that you need. Then you can just Google those details out to find what's the maximum RAM or graphic card they support! So that was all I had on How to check Laptop or PC specs folks. Hope this piece helped. If it did, I'd appreciate you leaving your feedback in the comments section. Also if you've got a question or doubt, I'd be more than happy to get you your answers as soon as time allows me. Ofcourse I wouldn't mind if you decide to extend a helping hand by sharing this article on your Social media, which keeps the lights on for us to keep going over here. How To Password Protect Any Windows Program? That's your problem? Well it gets solved right here and right now. That's what this article is about but that's probably already clear is it not? Now it's easy hiding files and folders on windows, but when it comes to How to set a password for Program (Application) in Windows that gets a bit complicated doesn't it? I mean you don't have to “hide” it, you've to password protect it. And then it's not a file or a folder, it's an executable, an application, a software. So well yeah I do agree it sounds a bit complicated, but it's not. I'll just go with some of the traditional methods to password protect any windows program without any software first, and then I'll list couple third-party freewares (free software) too if you don't want to do it manually. Well before getting into all those technicalities, let's get into some basics. What is the Difference Between Password Protecting and Hiding a Program? Password Protecting an application and hiding it are basically means to the same end, keeping the application safe and restricted to unwanted access. But there's this difference between password protecting and hiding the applications. When we hide them, others don't know they exist so they don't try to access them. But when we password protect it, it's not always necessary that they're also hidden (although that's an option). 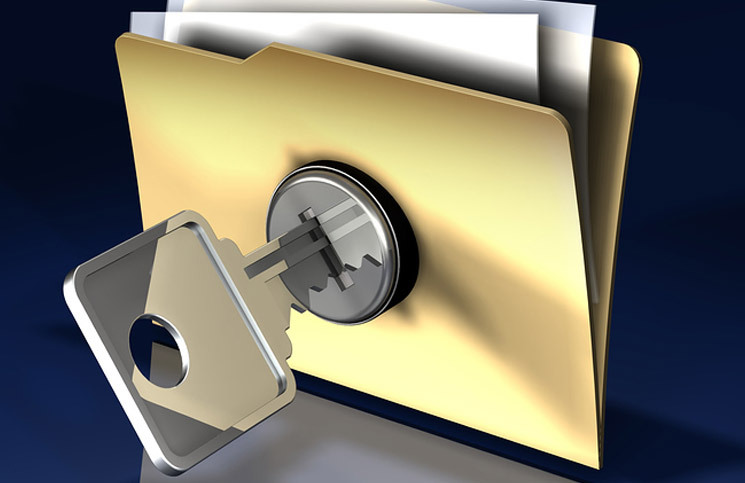 Hiding is a basic level of security, which if bypassed reveals the files and folders. While Password protecting isn't as easy to bypass, because even if the programs are already revealed, cracking a password isn't that easy. So okay let's get down to business. Now there are numerous ways to go about it. Let's start with the one that's the simplest. 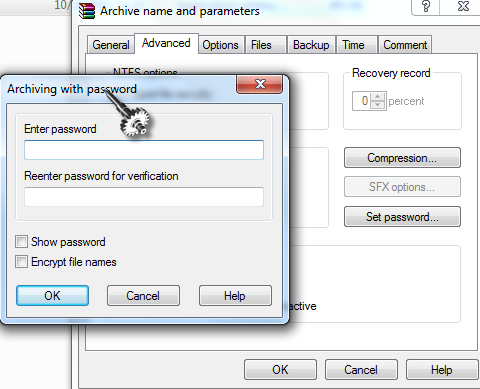 So Right click on the folder you want to password protect, and click on “Add to Archive”. Now click on the Advanced Button and click on “Set Password”. A popup would come up asking you for the password you want to set for it. Just set the password and click on Ok. Done! 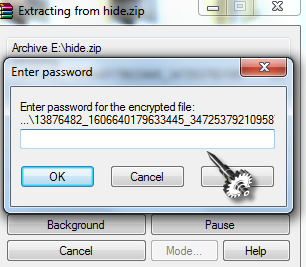 Now whenever someone tries to extract the file, they'd be prompted to enter the password for the file. Simple enough isn't it? 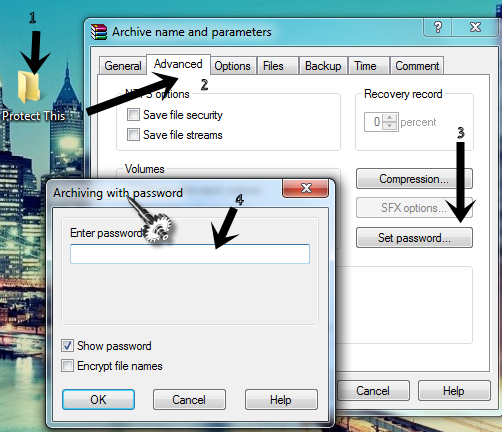 Well this is the fastest and simplest method to Password Protect a Folder in Windows. Now that we've password protected a folder, let's get down to password protecting the Windows Programs. Again, I'd say Winrar can be our simplest solution. Well to access any application on Windows, we need to double click on the “executable” or .exe file of that application, right? So it's basic knowledge that password protecting that .exe file would password protect the whole application. 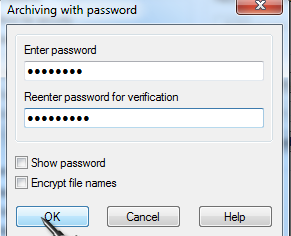 Copy the executable file of the application you're trying to password protect to a new folder. See? The .exe file is now in a folder. And delete the original .exe file from the desktop or any other place it might exist. That way, the only copy of the .exe file of the application that exists on your computer would be this file in your folder which you just copied. Now I do agree the above method was just a “solution”, the simplest one probably but not a very professional method to achieve the goals. If you're looking for more professional methods, continue reading. You need to download WinGuardPro. 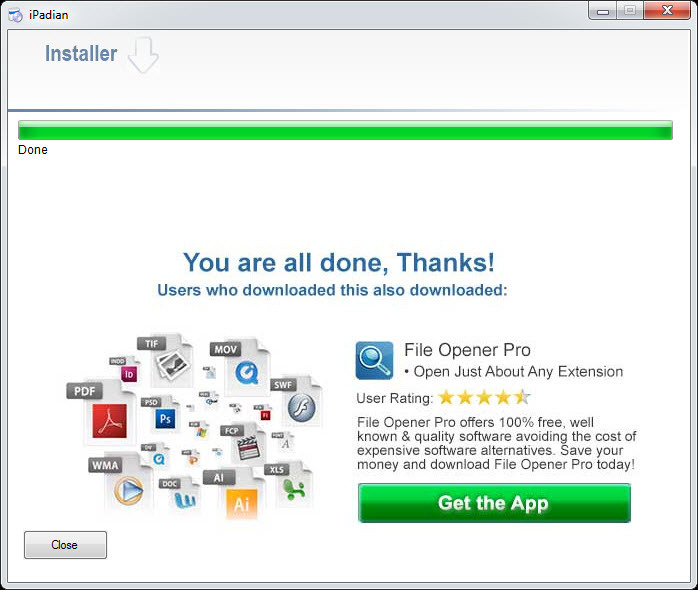 It's a free application that supports Windows Xp, Vista, 7, 8, and even Windows 10. So you can also use this as an answer to questions like How to lock specific app in window 10. Now It's only around 3mbs, so yeah it's light. Once you've downloaded it, install it and run it. It'll ask you to setup a new password for the application, so set your password. Once you're done, run the program you want to lock. Meaning double click on the application so that it's running on your system. 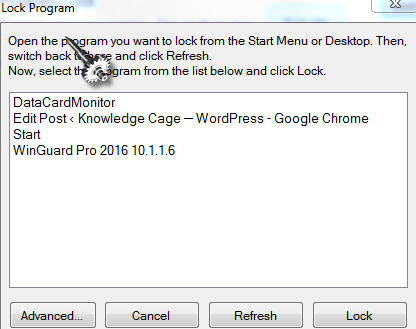 And then click on “Lock program” button inside WinGuard Pro. Now it will show you all the running programs on your system. Just select the program you want to lock, and click on Lock. Done! The program would be locked. Now everytime someone tries to access that application, he would be asked for the password you set with the application. Also, the added bonus is, WinGuardPro doesn't just lock any specific .exe file copies, it locks the whole code. 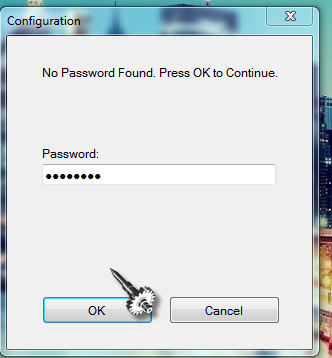 Meaning even if there's a copy of the .exe file somewhere else on the computer other than the one you locked, still it won't be accessible without the password. So that was all I had on How To Password Protect Any Windows Program guys. I hope this piece helped, if it did I'd love to hear your feedback in the comments section. Also do let me know if you're facing an issue, and if everything worked as planned, I wouldn't mind you guys hitting the share button and spreading the word around. How to Fix Dns Server Not Responding? How to Fix Dns Server Not Responding? That's what you're looking for, right? Well it's one of the most common Internet problems which will get solved by the end of this article. But before getting into all the details, let's start from the basics. I like to explain DNS servers in terms of “Phone directories of the internet”. That's what it basically is. Just like in a phone directory there's the name of the person on the left side and his number on the right. Similarly, a DNS server is a record of Website addresses and their IP addresses. Now how this is important is, we humans can spell out websites in english and other languages, but the internet only understands numbers, that's Ip addresses. So when we type in Knowledgecage.com, it's the DNS which looks up in it's directory and then connects the URL to it's IP addresses which is how we are able to access the websites. Now there are quite a number of reasons why this might be happening, so I'll just list out the most common solutions to the problem and that should help you fix your dns server not responding issue. We will try to determine the point of origin for the problem, see where exactly the problem is happening and then solve it. The most probably cause for this issue is that your internet connection isn't really connected. So all you've got to do is, verify the connection. Let's say if you're on a Wi-fi connection, just connect another device to the wifi and see if it works. 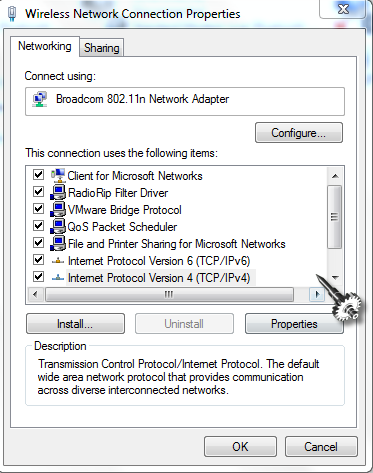 Or if you're on a broadband, try accessing the other machines on the same connection. Yet another method to test you internet connection is to download any other browser and then try to access the internet with it. If you can, it means your browser had some issues, and if not then well you need to fix your internet connection. There's a DNS cache buildup on your system for several positive reasons. But there are chances it gets outdated and hence can't correlate with your connection. So bottomline is, you need to manually flush your DNS to fix your dns server isnt responding problem. 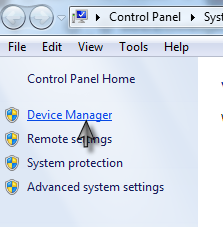 Click on the Start button, and in the searchbox type “cmd”.This will bring up the windows command prompt. Give it some time to process and once it's done, restart your connection. 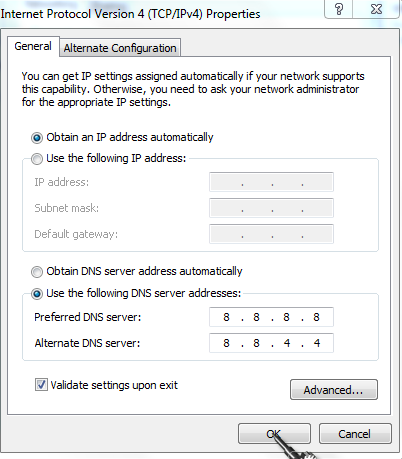 There's yet another option for you which allows you to change your DNS server manually. So click on start button again, and in the search box type ncpa.cpl > Click on the option shown in the screenshot. Right click on your Internet connection and select properties. Click on “Internet Protocol Version 4” and then click on Properties. Make sure that you've checked the “validate settings on exit” button so that you don't have to restart your computer for the changes to take effect. It's called the PowerCycle method, well because we will do something that's like a cycle and we will do it to the power hence the name. All you've got to do is, Powerdown your router > Wait for 60 seconds (so that no residue charge is left) > Power it back on. In my case, this solved the issue. Well at times, Windows creates extra connections on your system apart from the one you use, and this at time interferes with your current connection. So what you've got to do is, go to Control Panel > Network and Sharing Center. 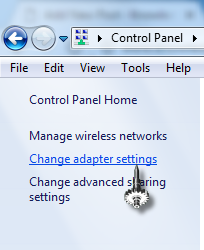 Now click on Change Adapter Settings. And see if any other connections are active apart from the one you're using. 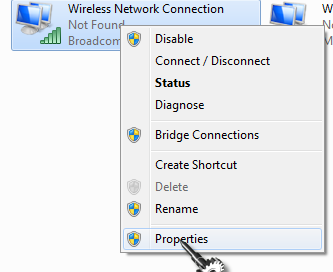 In my case, I'm using only the “Not Found Wireless connection”, while there are over 4 other connections active. 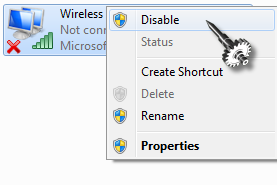 So what you should be doing is, Right click on these extra connections, and click on Disable. Ofcourse once you've disabled them you also can delete them, but I wouldn't suggest that because disabling does the job and additionally there might be situations in future when you might need those connections. Well I listed as many as 5 different solutions to the problem, right? I'm pretty sure they'll be enough. Try to Connect in Safe mode. 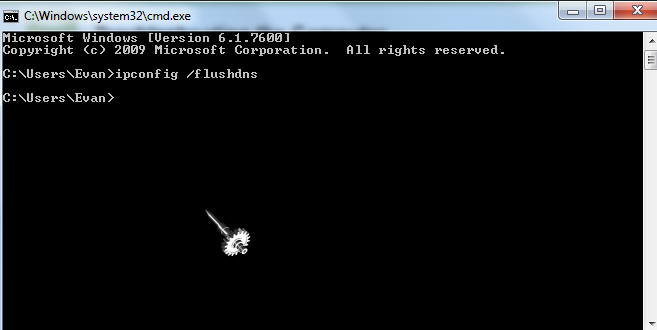 So that was all I had on How to Fix Dns Server Not Responding guys. I'm sure this piece should've solved your problem by now. But if it still pertains I'd suggest getting in touch with your ISP provider. Anyway I'd love to hear from you guys down in the comments section, so do make use of it. A share of this article on your social media too won't go unnoticed either. 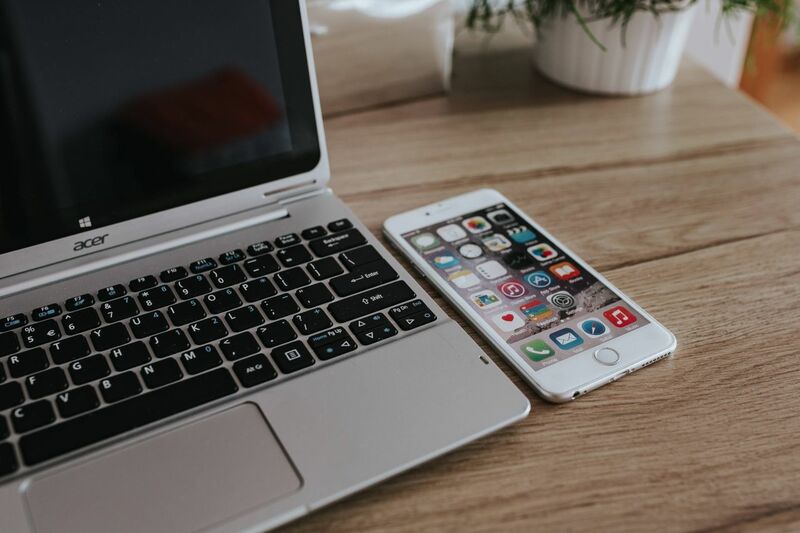 How to Use iMessage on a Windows PC? 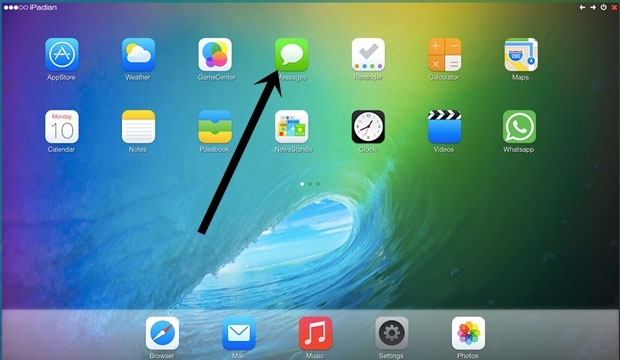 How to get iMessage for Windows? That's the question that's bothering you is it not? Well it won't anymore, because by the end of this article you'll have a definite solution to the problem, and it's absolutely free. Now messaging was always “easy”, be it SMS, Whatsapp or now iMessage, the only thing that keeps on changing is the simplicity. Considering the growth this industry is taking to, how could Apple not develop it's own messaging platform, so they did. ofcourse I'll be showing you how to get iMessege on PC, but before that let's get into some basics. As the “i” in the name might have already suggested, it's an Apple product. And the Message part is clear enough, it lets you message your pals. End of story. It's basically just Apple's version of WhatsApp or Facebook Messenger, ofcourse with quite a number of different features, but the basic goal and functionality remains same, letting you message with your buddies. Free Text Messages:- That's the whole point, right? To let you send free messages. Unlimited :- No limit on how many texts you can send. Delivery Reports:- I'd say there's nothing unique here, you get these with Facebook's messenger as well as Whatsapp. Group Texts:- Again a basic feature, you can group-text your buddies at the same time. Media:- You do get to send photos and videos too. So you might be asking, what's the difference between iMessage and SMS, well the very basic difference is that it uses your mobile data or wifi to send and recieve messages and not the account balance. And secondly, the messages sent over iMessage are encrypted while the SMS/MMS we generally send over SMS aren't as secure. Now Apple has always been about class and exclusiveness, right? So I thought to bridge the gap, why shouldn't we get iMessage for Windows, huh? How to Get iMessage For Windows? Apple hasn't released an official version of iMessage for Windows, and it probably never will. 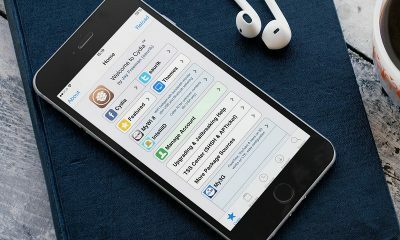 But there are always tweaks and tips you can follow and get iMessage for Windows. Also know this, using iMessage on Windows isn't illegal (It's not ethical maybe, but definitely not illegal). So feel free to continue. In order to use iMessage for Windows, you'd need a third-party iOS emulator for your Windows PC. So go on and download iPedian. 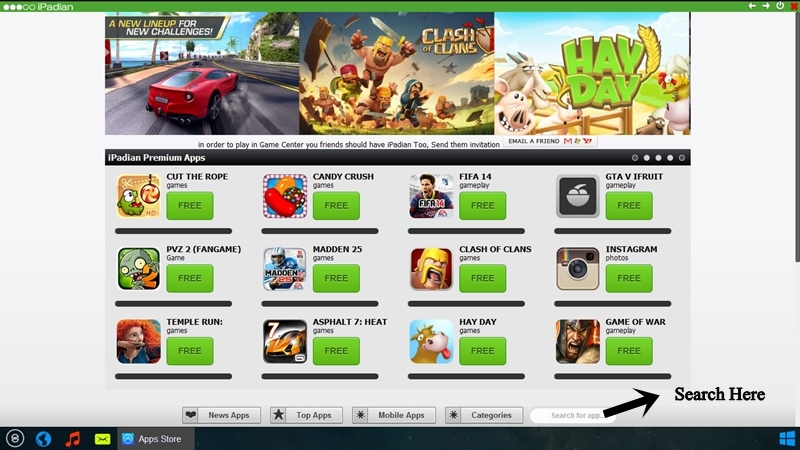 An Emulator is a third-party software, iPedian in our case which creates the virtual envioronment of a second operating system on your native system, that enables us to run any application built for this second operating system because technically it does run in the system it's built for. That's the reason it's not illegal. Because once you download iPedian, you'd get the virtual envioronment of iOS on your windows system, so you're actually running iMessage on iOS and not windows hence no crime committed. Basic Question:- Will you loose your Windows Installation once you install iPedian? Nope you won't. It's just a windows simulator for iOS. Meaning your system would start to look and feel like a Mac but it won't actually delete or change your operating system. The basic functions would still remain same. It's like installing a new theme to your android devices. Once that's done,you'll get a search bar just run the app and search for iMessage in the search bar. Once you find the app just download it as a normal application. What's happening is iMessage things it's on a native iOS device and not on a windows device so it won't give you any problems. So once you've downloaded it, you'll get the icon on your desktop (which now looks like MAC!) Just click on it to run it. Done!~ Here's an outline of the process on how to get iMessage for Windows. Download iPedian > Search for iMessage > Download & Install. The one feature I absolutely love about iMessage is “location sharing”. Basically if you're holding a party somewhere, it's so 1960 to text every friend the address manually, is it not? That's where iMessage gives you an edge. 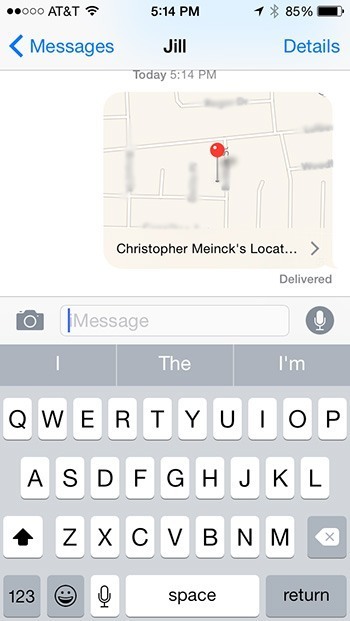 You can directly share your location with your friends without typing a single word. So you just reach where you have to, and then share your location with your friends and they'll know exactly where to be. See? You can share it indefinitely with them, meaning they can keep tracking your current location as long as you want, just like it happens in hacker movies, just without the hacking part! So that was all I had folks on How to Use iMessage on a Windows PC. I'm sure this piece should've helped you out with the problem. Do let me know if you're facing any problem with iPedian or the installation in the commentbx. Also do let me know if you've other solutions to the problem, if they're simpler than this I'd love to update this article. And well you can also use iPedian to download and use any other iOS app on your Windows PC using the same procedure. As long as you've iPedian, you can turn your normal laptop into a full fledged MAC, which I'd say is a good enough solution. So if this piece helped, I'd seriously appreciate you sharing this around, researching and writing these articles take time, all that keeps us going is your feedback and interactions.